I am writing this article as I am still seeing few cases where people are opting for life insurance products with a return element attached to it. For them insurance means tax benefit first and return second. For me Insurance and Investment are 2 separate wheels of a car and should not be mixed with one another. Life Insurance Correlates to Protection Cover whereas Investment Correlates to Return. Let me start with a simple example. Suppose you buy a new car and you also get a insurance so that incase of an accident, you have to spend less from your pocket. You keep on renewing your policy every year till the time you hold the car. However, once you sell the car, you stop renewing the policy and you dont get any return for all the premiums paid earlier. But somehow people want return when they pay premiums for their life insurance policy when the policy matures. This is not their fault as insurance is being marketed as an investment which offers both protection and return. People forget that just like car insurance was primarily meant to financially protect the owner from uncertain accidents, the value of a life insurance lies in protecting the dependents of the owner/insured by covering their current and future financial needs. "Investment is putting your money in a venture or financial instrument to make it grow. Insurance is an expense (in the form of premium) to protect your dependents from being financially vulnerable incase of untimely demise of the insured." Money Back Policy where one is covered upto a certain number of years. If the insured dies during this time the nominee gets the money. Incase the insured survives during this time, they still receive sum assured plus bonus (Please note this bonus is not a guaranteed payment). Premiums of such policies are quite high. Your insurance agent may advice such policies as his earnings are correlated with the premium you pay, that is, higher the premium you pay higher they will earn. Its not as if such money back policies dont offer return if you continue till the policy matures, it is just an expensive option as the premiums are quite high, and secondly one may get underinsured. Lets again take an example to explain the above. A 30 year old male opting for a term plan of 1 crore for 30 years shall cost Rs 8k-10k annual premium on an average. In money back policies, to get a cover of 1 crore you will have to shell out several lakhs as annual premium, which many wont be able to afford. So people reduce the cover to around 10 lakhs where the average annual premium varies between 30k-40k. Now if the person outlives the term plan policy he is entitled to get nothing. However, if he outlives the money back policy, he is entitled to get the sum assured as well as discretionary bonus. This is the reason why people opt for such policies as they feel they are getting something back for the money put on insurance. But here is the catch - If he chooses a term plan policy and invest rest of the amount in another investment vehicle of his choice (I would opt for mutual funds) for same number of years, the return will be better than money back policies most of the times. The only assumption I have made is the money grows at an average rate of 10-12% per year, which is quite achievable if you invest in a good fund. The second reason to avoid money back policy is that the insured may not get adequate cover that may fulfill the needs of the dependents. Your insurance cover is decided on the basis of various factors such as number of dependents and their lifestyle. In the above case if the person dies after 20 years, a cover of Rs 10 lakhs plus discretionary bonus at that time may be inadequate for his dependents. Normally, your insurance cover should be 10 times of what you are earning annually at present. 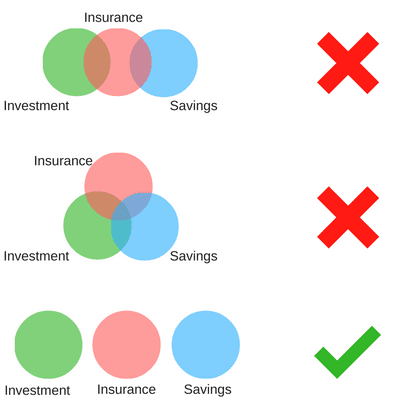 To conclude I would suggest not to mix insurance with investments as both are distinct and have a different end goal. Go for a basic term plan that can cover you long enough and invest the surplus amount in another investment option.